I recently participated in a cooking event at our apartment. 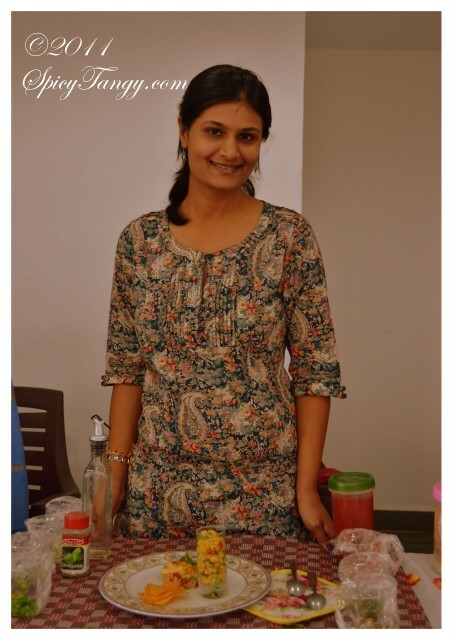 The event was 'Cooking without Fire' and had many constraints which was perfect to bring out the creativity. I wanted to share my recipe here. Participants must use boiled rice as an ingredient. Only 1 other ingredient can be cooked apart from rice. All ingredients must be assembled and plated at the venue and no use of fire or heat is allowed. One may use other ready-made store bought dry ingredients. 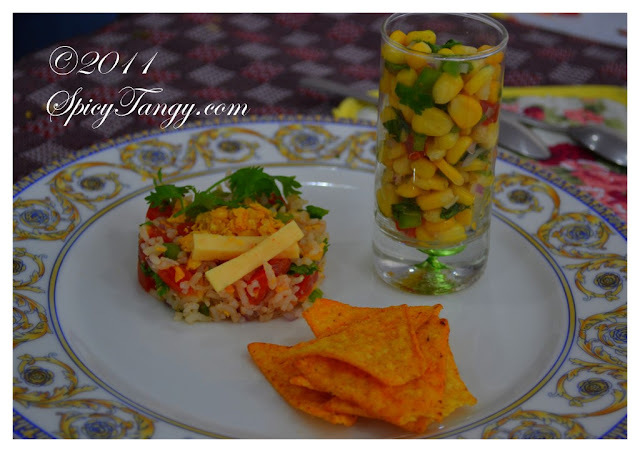 I decided to use Mexican flavors and made nachos rice with corn and basil salsa. It turned out nicely and you can make this as an evening snack for the family. Try it out and let me know how do you like it. Boil the brown rice in a pressure cooker. Brown rice takes a little longer than white rice, so you may want to cook them a bit longer. Boil/thaw the corn kernels and set aside. Chop the capsicum, tomato and onion finely and set aside. Crush the nachoes into small pieces and set aside. Mix all of the ingredients. Squeeze the lemon and mix well. Garnish with chopped coriander leaves. Chop the garlic finely. Set aside. Chop the basil leaves. Set aside. Mix all the ingredients and squeeze lemon, add oregano and salt .Mix well and serve along with the rice.